Multimedia is a production company, seeks to create an environment for young Palestinian filmmakers to train, have resources and produce quality documentary and artistic films, and make the films widely available. To offer artistic qualified trainers for the production of art and documentary films and documentary programs for the local media, TV stations, productions companies. creating competitive professional atmosphere of video productions of all those working in the field. Contribute in economic, social and cultural development of Palestine by building a high-standard and modern Local television stations, catering to the immediate social ,cultural, political, poverty alleviation and entertainment needs of Palestine society. To provide directors with financial and/or technical assistance for equipment that they need but lack the necessary resources to purchase them, or if they do not have sufficient resources to complete their project. To qualify for support, candidates must present a written script, and demonstrate adequate skills in handling film equipment and seriousness in their work. 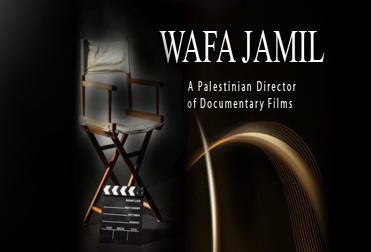 To promote the dissemination and exposure of films that communicate the effects of Israeli occupation on the lives of the Palestinian people at the regional and international levels. This will be realized by participation in film festivals in the Arab world and in western countries, as well as through broadcasting programs in Palestinian local television stations, Arab and international stations. Empower Palestinians to produce their own information and images, through intensive training of radio and television professionals and financial support for a one-year radio and television production and co-production period. Copyright © 2008 WafaJamil. All rights reserved.